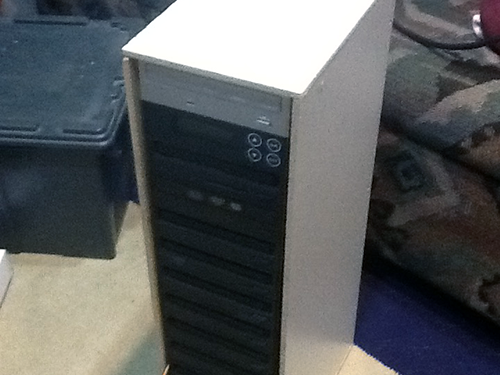 Of course I wisely waited until optical disk technology was waning before building one of these. 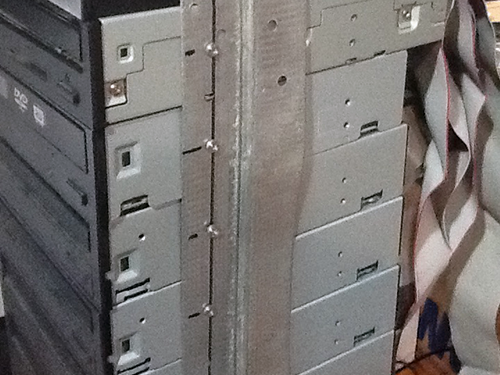 But I still have lots of call for burning multiple disks at once, and the drives started to come my way. Once again, the goal was to spend as little as possible and use old and used parts. The first step was to wire everything up. 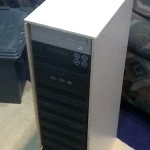 I salvaged an old power supply from a derelict PC to serve as the base. I had a dozen DVD writers and a controller card already, so it was just a matter of connecting it all. 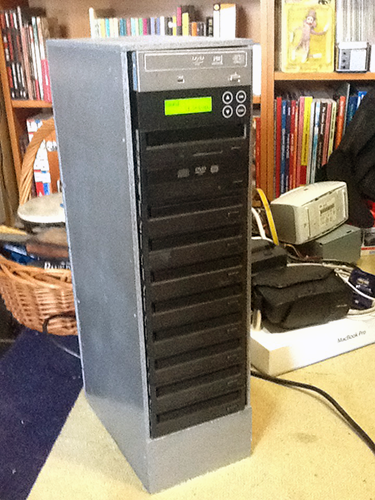 You can read the power requirements on the side of the DVD writers – they are about 7.5 Watts each. So a dozen of them can still be adequately powered by a 150W or 200W power supply, both of which are pretty wimpy by PC build standards. Here’s a picture showing the wire-up. I had to attach numerous additional molex connectors on the line coming out from the power supply – mostly because I was a bit worried about identifying all the wires on the other connectors coming out of the PS. It’s quite likely that I had the correct voltage coming out of a few different strands of wire connected to the PS, but I did not want to test it all, and felt nervous about rerouting those. I did salvage the molex connectors from other used/abused computers, though, and carefully pried them apart to fix them on the existing 4-wire strand coming from the PS. 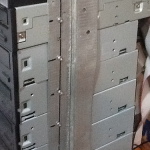 Similarly, I was able to salvage a number of 40-pin IDE connectors from a couple old PCs, but not enough to cover all the drives. They can still be found for a couple bucks each, although since these are IDE drives, not SATA, they’re getting hard to come by. I did realize that you can pull off old IDE connectors and reattach them to the ribbon cable just by pressing the two halves of the connector together in a vice. But you cannot find rolls of 40-pin ribbon connector so easily, so you’re stuck using salvage ribbon until it runs out. You can see the controller card under the top drive. This makes it easy to know which drive is the master. 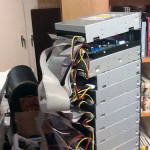 You can see there are 11 drives total in the chain – the controller has terminals for a dozen drives. 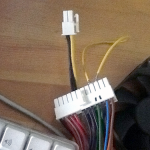 Since the PS had an extra set of molex connectors for SATA drives, I was able to clip the ends and connect a spare fan. I’m not sure if I need one, but there does not seem to be any reason NOT to have an extra fan in a DIY build. I had to look up the pin assignments, but apparently there’s 12 volts off the yellow wire and both black connectors are ground. If for some reason I wanted to mix SATA and IDE sources, I guess I could use these. And if I needed to run another line of molex power connectors, I could have used these. But the SATA line is a bit shorter than the IDE line, so I kept attaching power connectors to the IDE line instead. Apparently the really big molex connector that connects to the motherboard also controls the on and off. So if you just plug in a PS you’ll get nothing until you can work out how to keep the power on. Normally that is done through computer’s power switch and something on the motherboard. 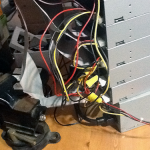 Here I’ve identified the green and black wires as being the ones to short out for power. Later I’ll snip these ends and connect a switch, but there was no reason to do it until I had everything in place. I just marked them with a sharpie for now, and kept the wire in the socket to short it when I needed to test the device. I had a bit of a slow start with the IDE connectors (a couple of my hand-made ones were bad) but I soon had everything humming. I did a test of all drives to make sure they were burning and that the device was not reporting any errors. And here’s where things got real hillbilly real quick. 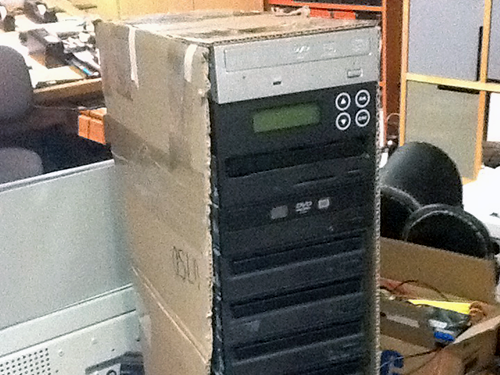 There was absolutely no cage or case to put this monster in. I had to build something. The first thing I thought might be necessary was to strap everything together. Here you can see the aluminum strap with the usual drive screws used to keep it all together. I wanted to make sure that I could swap out a defective unit at some point if I needed to. This could have been a LOT nicer, but I figured that I probably would not be doing a lot of swapping out drives, so it was OK if it was bit rough. I recommend pretty much any solution other than this one, which is pretty lame. This one definitely works, but that’s about all you can say for it. And since the ultimate goal is to hide all this anyway, it’s not like anyone will know. 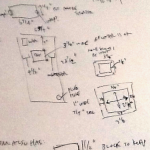 This next step was fairly smart, though, and I recommend it highly. 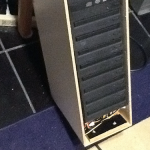 Since I had no case, I knew I would have to build one out of scrap wood we have in the shed. 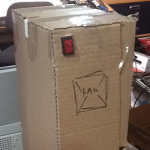 So I prototyped in cardboard, which is super easy to work with. 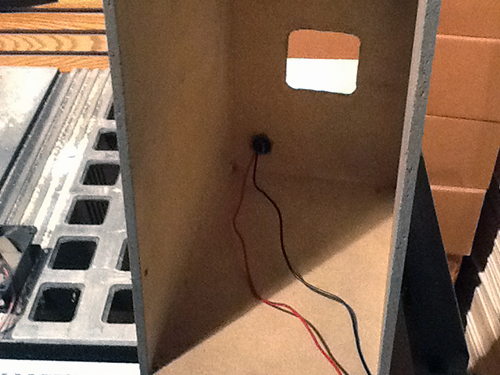 Once I had everything in place, I could generate proper measurements from my crappy taped-up cardboard version. 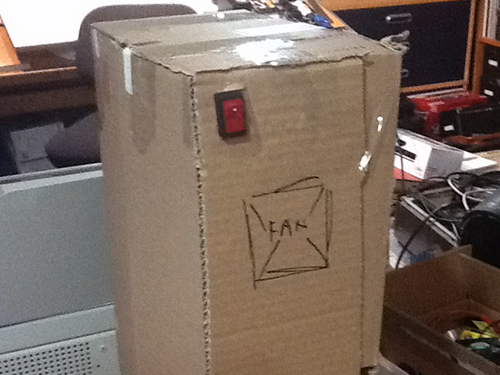 This photo shows the back, where I arbitrarily placed that fan but more carefully placed the on switch. It may be necessary to point out here that the total costs of this unit so far are negligible. The controller card was the most expensive part, and I had bought it quite a bit earlier – years ago – so it was a sunk cost. Even so, they run around $50 or so. Maybe they are more now that no one uses IDE drives anymore. And here is the front of the unit. 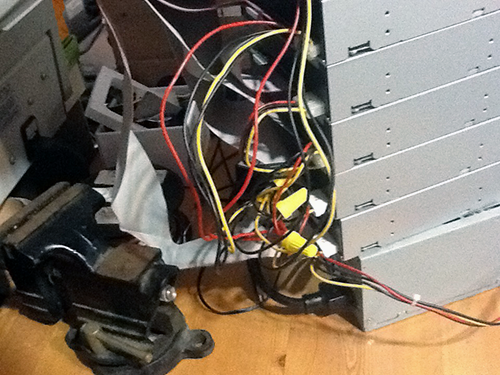 I decided that I was NOT going to enclose the front of the drives. They are just sitting in there, like a shelf. This is good for a couple reasons, mostly because air will flow around them, and secondly because I’m really lazy. I just could not imagine how I’d machine a kind of front plate for something like this. Plus I was already spending too much time on a unit I don’t even know if I’ll use that much. 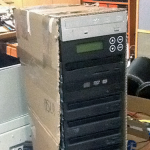 Although it’s also worth noting that a 10-unit disc burning tower, if you buy it new, could cost over a thousand dollars, easy. No, really, I just checked. 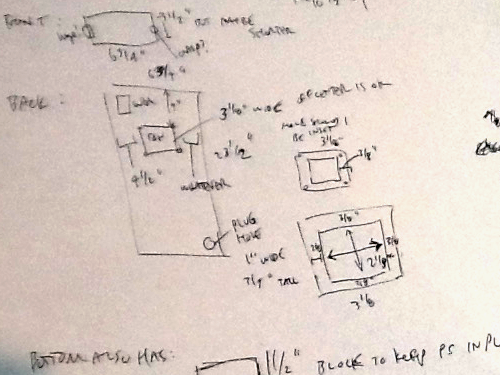 And here are some scribbly notes I made so I could take them to the saw when I made the case. Once the cardboard version works you can just cut it apart with an X-Acto knife and measure it. 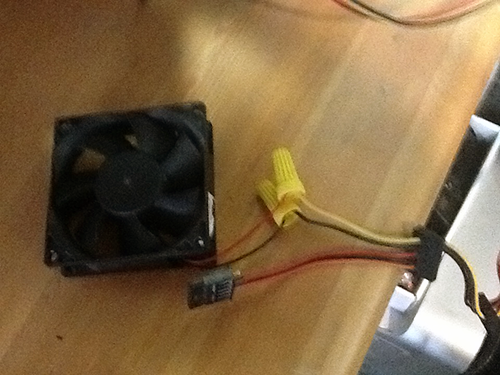 You can see here that I kind of worried overly about that fan and how I could attach it. In the end I just welded it on with a hot glue gun. I did have to cut the hole the right size, though, so it was useful to figure that out. I didn’t have the proper saw I’d need to make these holes really good. I just used my biggest drill bit and then finished it off with the X-Acto. 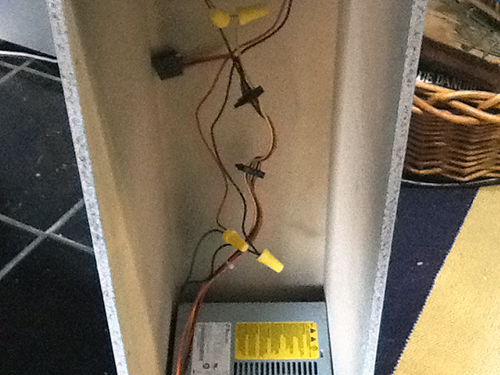 Here’s the front of the unit now built with everything in place for a second check. I happened to have a massive quantity of pressboard that was 1/4″ thick and – even stranger – the appropriate 10 1/2″ in length. So cutting the sides, top, and bottom were easy. I have a finishing nail gun that shoots brads, so I banged it all together in no time at all. I suppose you could also have glued it first and held it in with clamps and a vice. But it’s just pressboard, and it’s not meant to take a fall off a building or anything. This ersatz case is only meant to keep it all together and from looking so crap. Here’s another test with the power supply in place. Rather than clip and cap all the unused PS wires, I figured it was probably safest – and best – to just leave them in the connectors where they were not doing anyone any harm. 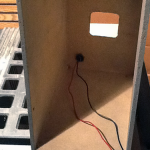 This photo shows how I’m testing to see how to coil those wires up in front. 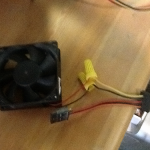 The front of the power supply also has an air intake. I’m certain the PS will not overheat and there will be enough air coming in, but I did not want to bunch up all that cable and block it either. This also showed me that the PS would sit further back in the case, and that this would not leave the drives anything to rest on. 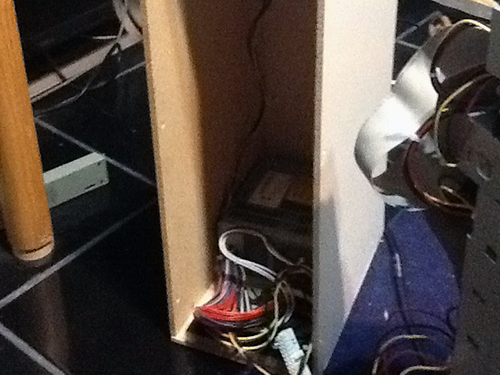 It will be necessary to build another little shelf at the bottom to cover the wires and the PS. One attempt to deal with the shelf/PS issue. I could not foresee this properly in the cardboard phase, unfortunately. Here I’ve just screwed in a single piece of chipboard about 3/4″ thick (another scrap from some dead piece of IKEA furniture someone left out on the curb in my neighborhood, and which I rescued for just this kind of experiment). 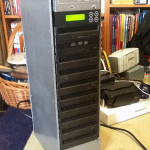 It’s obviously not going to work because even though it keeps the PS in place and hides all the cables, it is not tall enough to give the drives something stable to sit on. So I have to go back and cut a new piece. This is the assembled box with the back on and the switch set in. 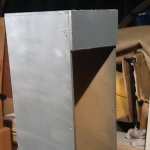 The back is also nailed on with the finishing brads. I’m surprised how sturdy this is now. I mean, it’s not going to take my weight if I sit on it or anything like that. But it’s actually pretty durable, and the edges are good and straight. Not only can I put this unit on a shelf, but I can stack something on it without worrying the whole thing will come crumbling down. I know that seems like an obvious design goal, but when you bash stuff together out of junk you often don’t make the best decisions. You tend to use what you have lying around. 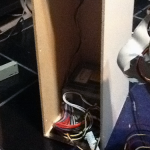 That switch, by the way, is at least 20 years old, and was bought for some other long-lost project. I’m sure they don’t make those anymore. Here’s the solution to the PS shelf. 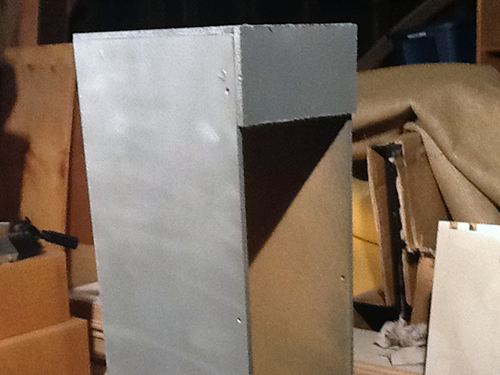 This is the unit upside-down now, with a new “front” piece cut and nailed on. The PS will sit behind that, and the whole thing will look neater. I gave the whole thing a coat of pain to hide the defects. All I had was this grey/aluminum stuff. Not sure what it was originally for, but it was what I had in the shed. Again, the goal here is to spend no money. During this time I was also suffering from the flu, so we can see some of my decisions as having been informed by an overheated brain. 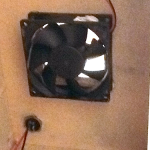 Here’s that fan hot-glued in place. A surprising number of electronic components are actually hot-glued in place in real manufacturing. 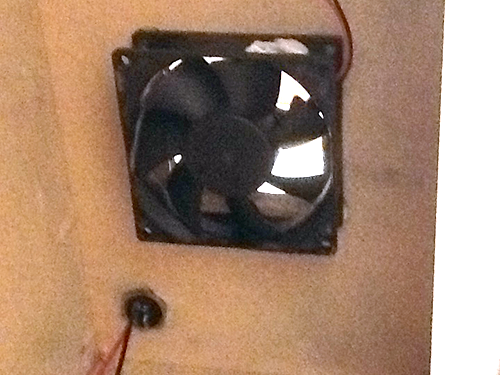 Moreover, since a fan is constantly vibrating and oscillating in place, it probably reduces noise to cushion the fan with a glob of glue. Oh, who am I fooling? I was just totally lazy, and rather than dig through everything to find some kind of mounting hardware I jammed this on with a glue gun. I could have added google eyes while I was at it, maybe some fake fur. Come to think of it, maybe I will do that later. The fan did come off an old CPU, though, and was held in place by a combination of scews that were machined into the heat sink on the CPU block. They actually were held in by some kind of cushiony glue wad. So I’m not that far off. Twist connectors seemed like the obvious choice for wiring the switch and the fan simply because if I ever end up swapping out components it will be easy to disassemble. 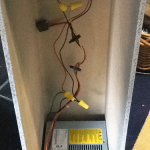 So here’s the extent of my box wiring. Not shown: the massive molex cable with 11 ends (for the drives) and another set of twist connectors keeping those strings all together. All of those additional cables not shown will be coming out of the front of the PS and will be tucked in behind the drives along with the IDE cables. Once again I fired everything up to make sure all was well and the fan was not buzzing against any wires since it was close to the IDE ribbons. There it is. It all works. The logic of the controller board is actually quite simple: put in a master disc, load up the slaves and they just start copying. When they are done they beep and eject. It’s kind of wonderful. 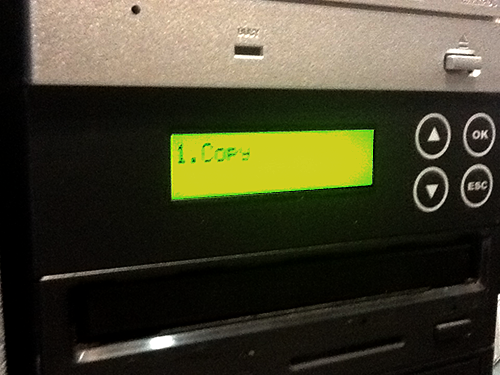 I made 10 immediate copies of a DVD and then wondered what would be next. 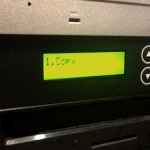 It makes short work of any duplication task. I hope my efforts are somewhat useful in the end; I’d hate to have made this thing, “saved” over a thousand dollars, and then to not use it that much. I keep telling myself that there are yet some new art projects that may involve optical discs (which are getting to be as quaint as cassette tapes, I guess) and that this will come in handy when I make my own little “Box in a Valise” style projects. And the final project stands proud. Note the gap at the top left – that’s from the drives just sitting in the shelf like a block. Looks kind of shabby, but I don’t mind, and if the unit sits properly it’s not really as big a gap as it seems in this picture. Total cost of the endeavor seems to have been about $50 plus about $10 for cables. Though the controller was a sunk cost for my current budget (like that switch, but not as old) it’s worth counting because it had no other use than for this project and was purchased exactly for this reason.